Today I have the second recap of my LA trip (and nail polish dream vacay). If you missed the first part, you can read it here. 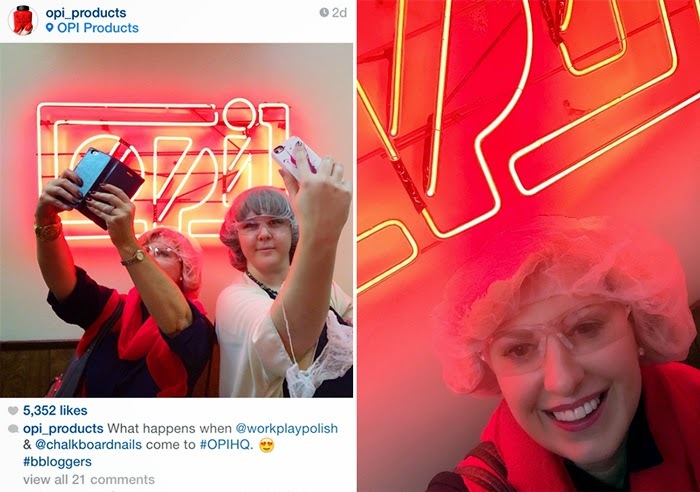 So on the last day before Sarah (Chalkboard Nails) and I left LA, we headed to OPI Headquarters for a tour. This was seriously a highlight of the trip. 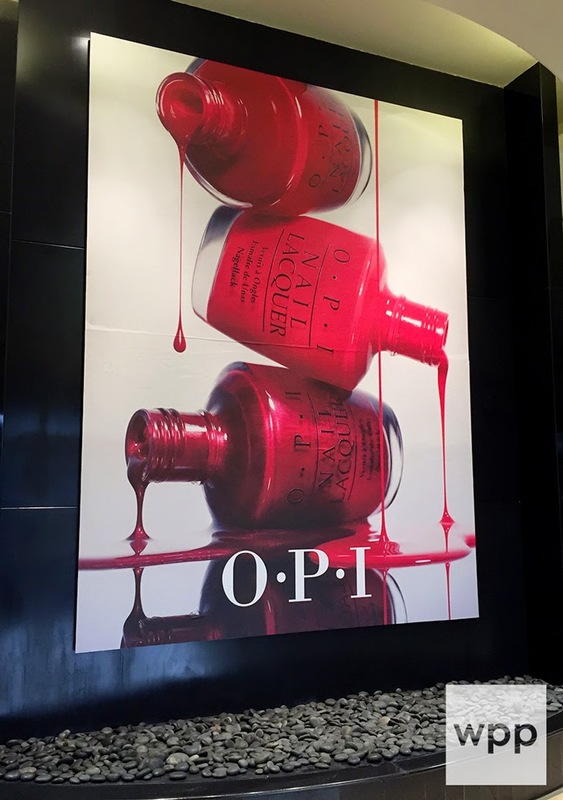 I'm not ashamed to admit that I was emotional as we walked up to the OPI offices because I couldn't believe that my li'l ole' nail blog had gotten me here. I'm so grateful. Of course, the lobby is decked out in polish. As we were waiting, in walks THE Miss POP! I recognized her immediately. She's a New York-based celebrity nail artist. You've seen her work a hundred times...on the covers of magazines like ELLE, Marie Clare, Cosmo, and more. 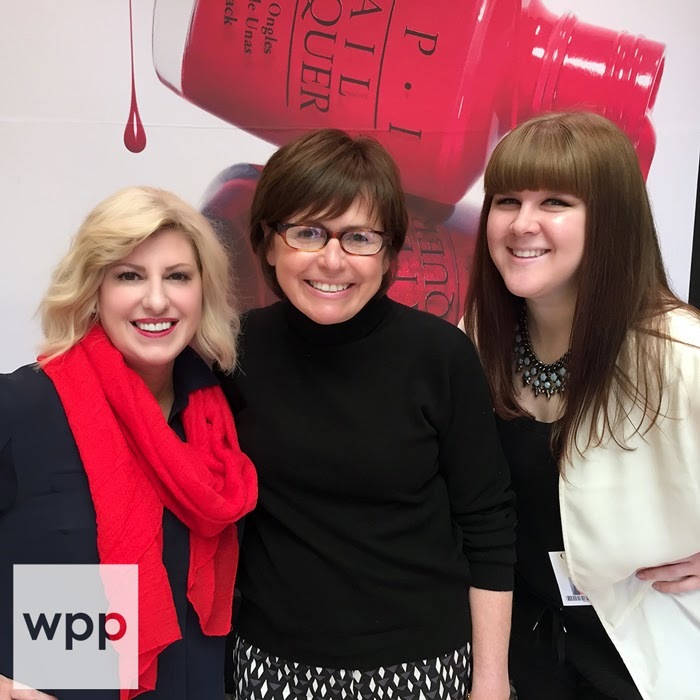 With all the amazing work she's done with OPI (she just returned from doing OPI nails at NYFW), she'd never been on a tour...so she went with us! She has such a great story and was so generous with her advice. I'm so glad I had the chance to get to know her. Before the tour, we got to meet Suzi Weiss-Fischmann!! That was completely unexpected. She is so sweet and genuinely appreciative of what nail bloggers have done for the business. I was speechless! Jaq was our host. She's a media guru and strategist for OPI (and probably one of the most stylish people I've ever met.) I felt like a midwestern mom the whole time compared to all of these fabulous people. LOL. 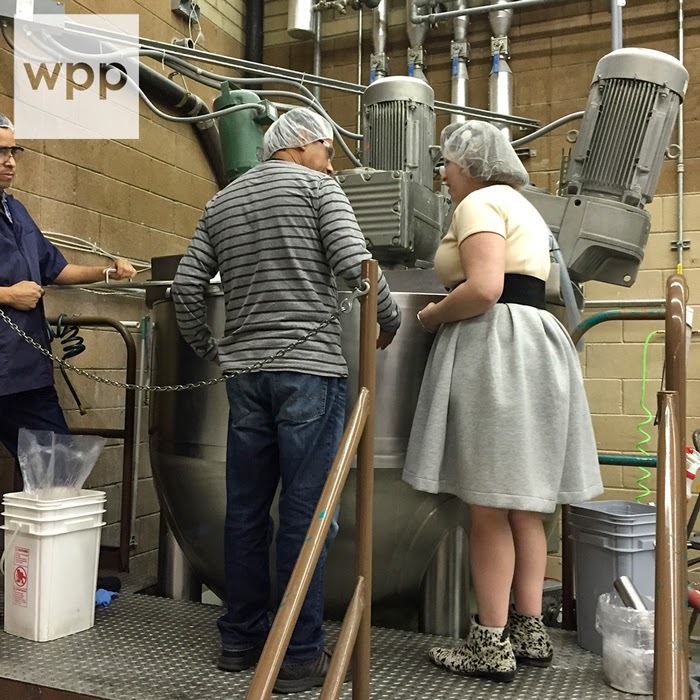 She and Sergio Aguirre, the OPI Director of Manufacturing (and an engineering genius) took us on a behind-the-scenes tour of "where the magic happens." Before we started the actual tour, we were introduced to so many other amazing people that make OPI happen. OPI doesn't outsource much, if anything. 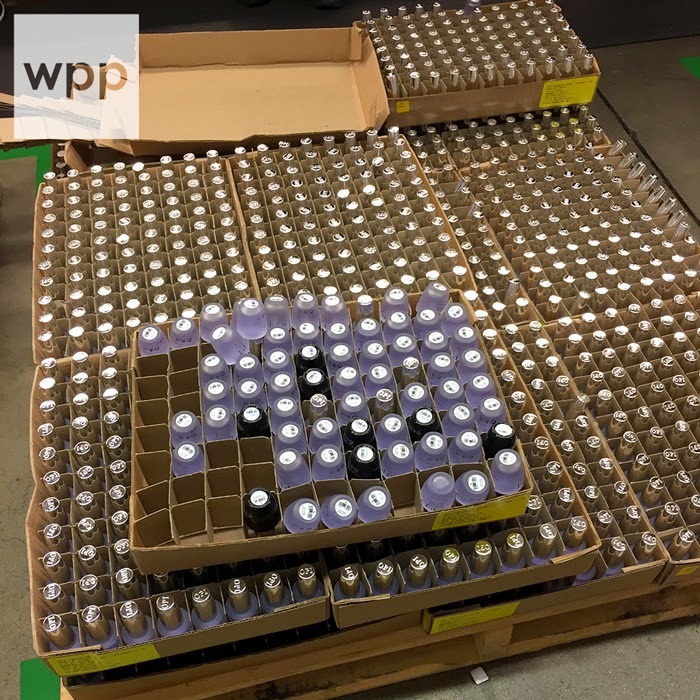 Design, testing, manufacturing, packaging, distribution, advertising, and more are all done out of this facility - and they have customers worldwide...so you can imagine the talent under that single roof! Next stop was packaging. 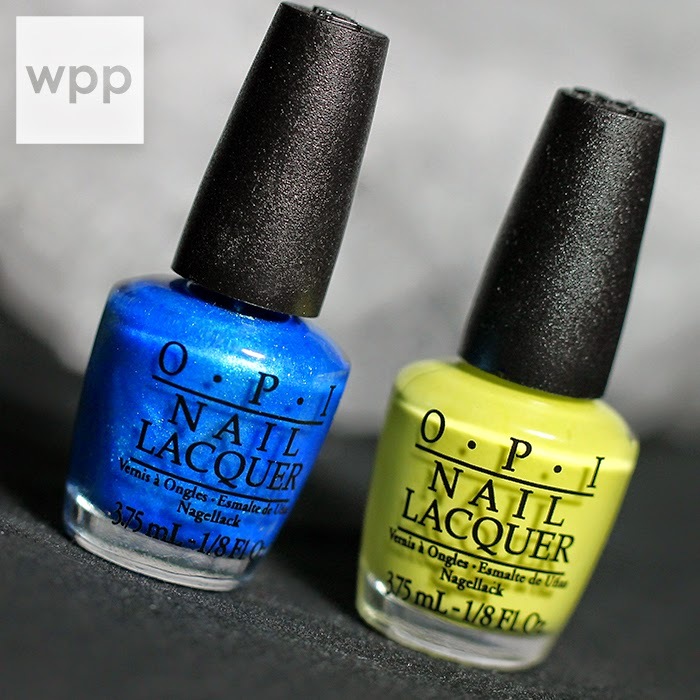 OPI is unusual in that vendors literally open the box, pull out the display, and set it on the shelf. All displays are fully assembled before shipping. (Most companies ship displays flat and the store puts them together.) I couldn't snap a pic, but I saw a table full of new Coca Cola displays! It was crazy to see pallets and pallets of polish everywhere! Here's some Infinite Shine Topcoat waiting for it's "ride". 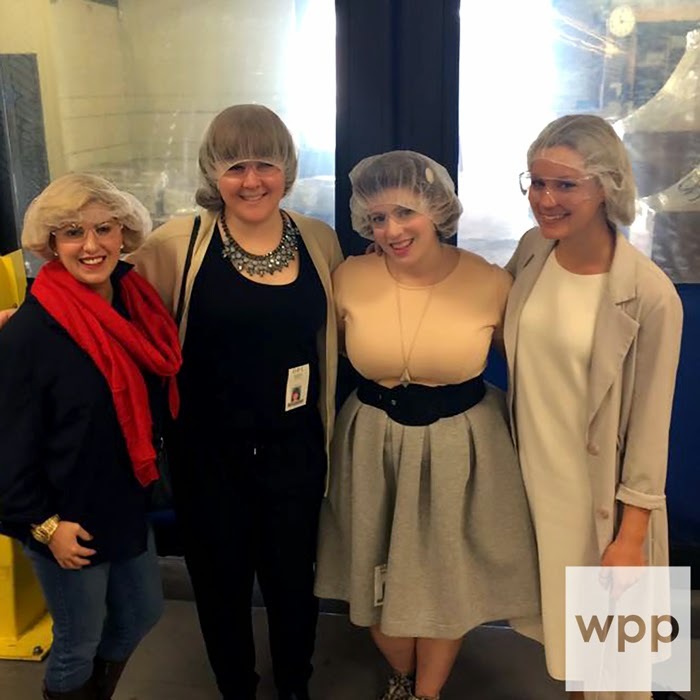 The rest of the tour required hairnets. That's me, Sarah, Miss Pop, and Jaq. They make their head wear look like it came off the runway. Mine looks like a deflated souflee or a bad muffin top. LOL. Seriously, why is my net all fat at the sides?? What smells amazing? OPI lotion. What smells even more amazing? An entire vat of it! Here's Miss Pop getting an up close look at the process. I should note that Sergio's hands were amazingly soft! Next, more vats of goodness. Here, Miss Pop describes how good it smells. I believe this one was Pedicure Mask. It smells like cucumber and green tea. OPI Headquarters has grown to a collection of buildings. It's more like a "campus" now. The testing room is in the original building. On our way there we passed by large drums of polish. Wow! Can you imagine an entire drum of My Very First Knockwurst? I could take a bath in it! There were a few other areas we saw at this point that we couldn't photograph. 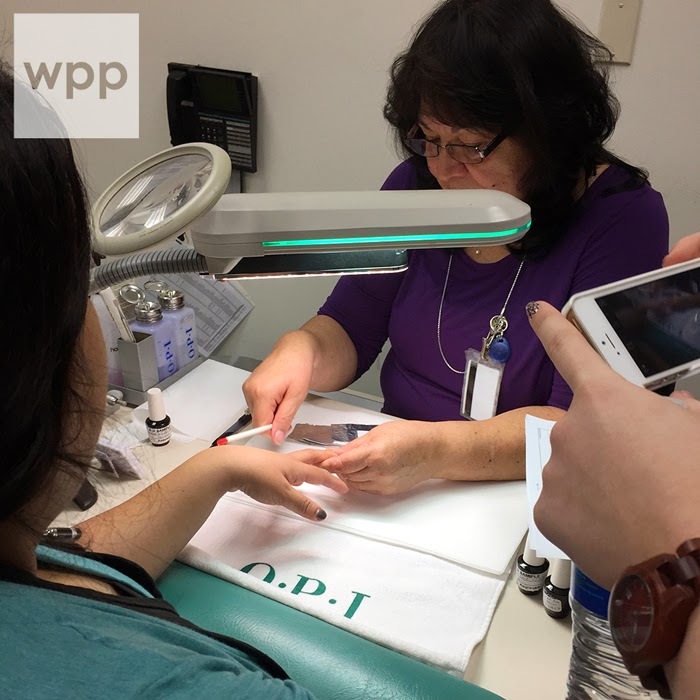 Suffice it to say that OPI has some amazing engineering staff and it's no wonder they can fulfill orders worldwide! 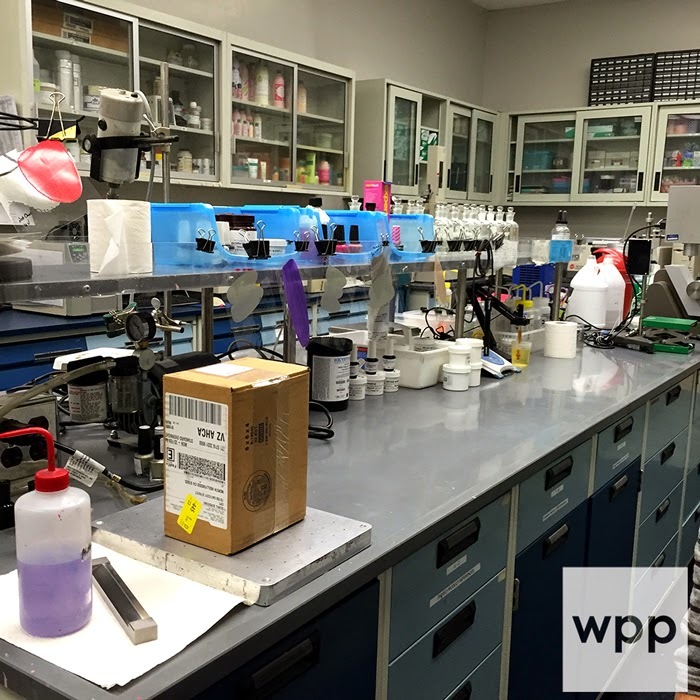 In the testing room every single item OPI produces is painstakingly tested. I didn't get a picture of it, but right beyond this room is a small office which served as Suzi and George's first office way back when OPI was born. I love hearing about company histories, so I was excited when beyond that office was a hallway with old advertisements and the original OPI logo. If you follow the OPI Instagram, you might have caught Chalkboard Nails and I in action doing selfies in front of the original OPI logo (at left below). Here's the actual other side of that shot. Don't you agree that I NEED that sign for The Mani Cave??? 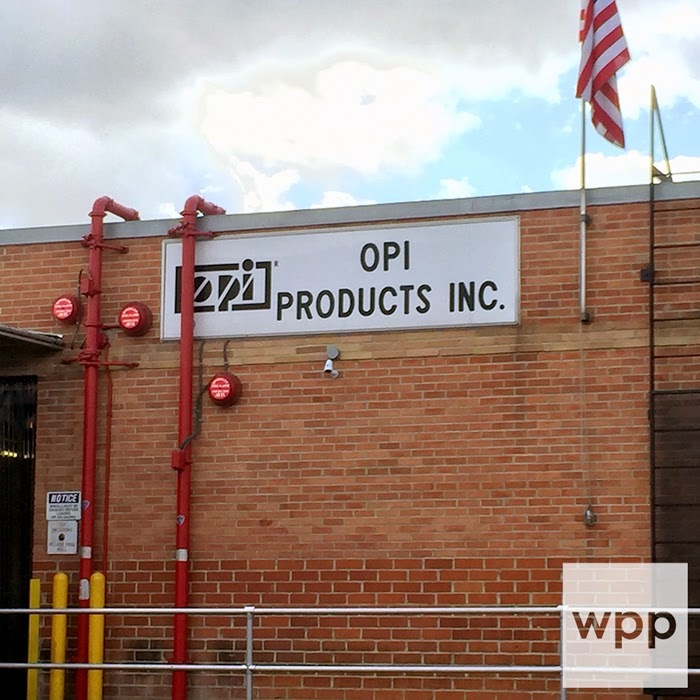 The original OPI sign still hangs on the side of that building. 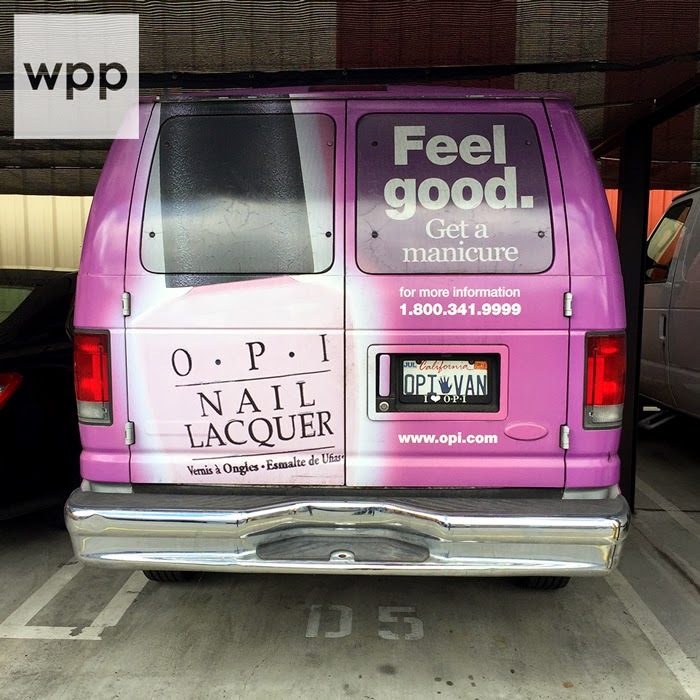 On the way to the next building, we passed the OPI van. I had to have a shot of that van, right? And here's where the real magic happens...bottling. I felt like I was in an episode of "How it's Made"! We weren't allowed to take many pics at this spot, but I did get a few. Here's Love is Hot and Coal coming off the line. After the tour, OPI treated us to a Thai lunch (the first time I've tried it!) I've got to say, this tour was certainly a high point in my nail tech/blogging career so far. I think OPI should do a contest with a tour as a prize some day! Would you enter? I was so honored to see it. And even more honored to experience it with Chalkboard Nails and Miss Pop! 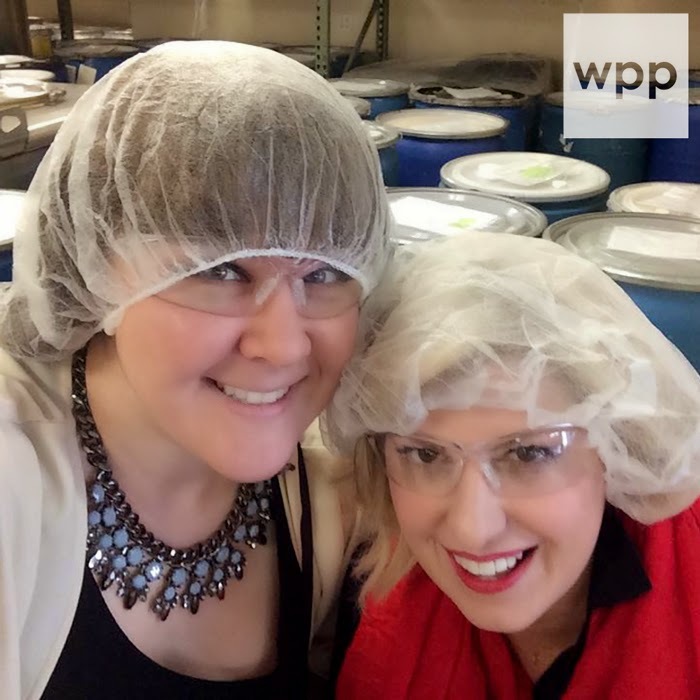 In fact, I'll leave you with one last hairnet shot! Sarah took lots of cool video (in the correct orientation!). I'll add a link to it here once she has it done. No matter your social media of choice, OPI is on it! Follow them on Facebook, Twitter, Tumblr, Instagram, YouTube, Pinterest, Google+, and even Snap Chat at OPIsnaps for news, promotions, and maybe even the occasional look behind the scenes! And if you're a pro, be sure to register at www.pro.opi.com.